Minneapolis, Walker Art Center; Los Angeles, REDCAT and Buffalo, Albright-Knox Art Gallery, Julie Mehretu: Drawing Into Painting, April 2003-March 2004. Museo de Arte Contemporáneo de Castilla y León; Kunstverein Hanover and Humlebaek, Louisiana Museum for Moderne Kunst, Julie Mehretu: Black City, September 2006-August 2007, p. 99 and 101 (detail). Julie Mehretu's Excerpt (Molotov Cocktail) is an explosive cacophony of mark-making, both lyrical and frenetic in its ebullient dispersal of paint and ink. Precise lines and rigid angles merge with expressive arcs and waves, whilst dots, dashes, stabs and smudges dance across the pictorial surface like scrambled punctuation marks. The work is structurally dominated by an outward burst of radial lines, emanating from a central point of detonation. The force of the blast is palpable-almost audible-and we are drawn into an electrifying world of noise and speed. 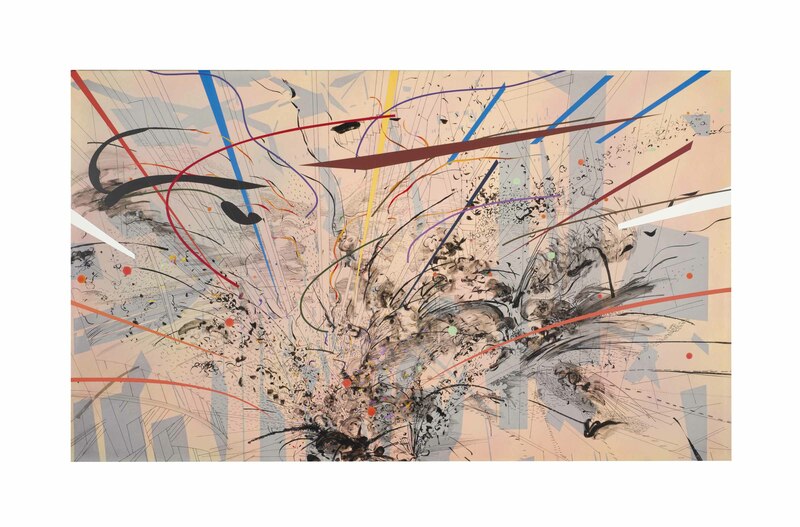 Highly-charged and visually arresting, Excerpt (Molotov Cocktail) is an outstanding example of the distinctive visual language that Mehretu has cultivated since the late 1990s. Combining the diagrammatic language of architectural planning with her own vocabulary of visceral symbols and gestures, Mehretu's acclaimed practice seeks to visualize the social and geographic terrain of contemporary urbanity. Executed in 2003, the work is part of a series of eight Excerpt paintings exhibited in the artist's first solo museum show at the Walker Art Center, Minneapolis. Its subtitle, Molotov Cocktail, vividly captures the heady alchemy and potent elemental fusions that have come to define Mehretu's universally celebrated idiom. Born in Ethiopia, raised in Michigan, educated in Senegal and Rhode Island and with studios in New York and Berlin, Mehretu conceives her works in globalized terms, taking cartography, architecture and urban geography as launchpads for virtuosic paintings, drawings and prints. The artist frequently cites her residency at the Museum of Fine Arts in Houston (1997-99) as a turning point in this regard, marking her first use of architectural drawings and blueprints as backdrops for her own personal system of rhapsodic inscriptions and symbols. By the time of the present work, this tendency had become a powerful and sophisticated tool for not only for visual abstraction, but also for social, historical and geographic commentary. Building upon studies of military maps, NFL game plans, airport diagrams and architectural blueprints, Mehretu's interest in the constructed world is tied to a concern with the power structures that have determined our development since the dawn of civilization. The individual graphic marks that efface the diagrammatic backdrops of her works are imbued with identity and social agency, conceived as characters in overriding narratives of struggle, rebellion and uprising. "I charted, analyzed, and mapped their experience and development: their cities, their suburbs, their conflicts, and their wars", claims Mehretu (J. Mehretu, quoted in L. Firstenberg, "Painting Platform in NY", Flash Art, Vol. 35 No. 227, November-December 2002, p. 70). Observing the present work, rich in optical and spatial effect, we are gazing not just upon specific times or places, but upon entire histories and universes. Taking their place within this unique artistic practice, the Excerpt paintings of 2003 are amongst Mehretu's most lustrous and cataclysmic works. Variously subtitled Citadel, Battle Track, Riot, Regiment, Suspension, Paradigm and Suprematist Evasion, as well as the present Molotov Cocktail, they capture abstracted moments of tension, ignition and outbreak, in which their architectonic underlay is challenged, suppressed and overwritten by visual pandemonium. Like densely layered snapshots or soundbites, Mehretu's quasi-apocalyptic visions confront the viewer with an overwhelming sense of simultaneity. As the artist explains, "I am also interested in what Kandinsky referred to in 'The Great Utopia' when he talked about the inevitable implosion and/or explosion of our constructed spaces out of the sheer necessity of agency ... [I]t is in these same spaces that you can feel the undercurrents of complete chaos, violence, and disorder. Like going to see fireworks - you feel the crowd at the same time as you feel the explosions" (J. Mehretu, quoted in "Looking Back: Email Interview Between Julie Mehretu and Olukemi Ilesanmi, April 2003", in Julie Mehretu: Drawing into Painting, exh. cat., Walker Art Center, Minneapolis, 2003, pp. 13-14). Indeed, the pyrotechnic graphic impulses of Excerpt (Molotov Cocktail) may be said to resemble Kandinsky's own improvisatory lexicon, in which all sense of space and time is exploded through a maelstrom of polymorphous abstraction. Yet like Kandinsky's musically-inspired compositions, here Mehretu draws a thin line between anarchy and celebration; the city is a site of chaos but equally of ecstatic furor. "Places like Lagos or Times Square on a Saturday night are completely intriguing to me in their supreme dazzling capacity", she claims in the same interview. "I want my paintings to convey and reflect this type of speed, dynamism, struggle, and potential" (J. Mehretu, ibid., p. 14). The canon of art history finds itself upended and realigned in Mehretu's devastating panorama. The geometries of Mondrian and Malevich collide with the emotionally-charged markings of Vincent Van Gogh, the schismatic linearity of Cy Twombly and the automatism of Surrealist drawing and writing. Artistic influences from Le Corbusier to Jackson Pollock make their presence known, alongside an acknowledgement of graphic systems spanning Chinese calligraphy, graffiti, comic book illustration and tattoo design. As Douglas Fogle has observed, Mehretu's ability to fuse together real and imaginary topographies, through her blend of diverse visual sources, ultimately casts her work as a new kind of history painting. "Her paintings...do not rely on the recognizable but on evocative shards of graphic iconography", he writes. "She shows us a vision of history as though told through the fractured prism of a Robbe-Grillet novel or projected into a painterly version of the computer game Sim City" (D. Fogle, "Putting the World into the World", in Julie Mehretu: Drawing into Painting, exh. cat., op. cit., p. 5). Ancient civilizations and futuristic empires join hands in Mehretu's work, which the artist frequently conceptualizes in militaristic terms of mobilized armies, battles won and lost, and worlds on the brink of formation or demise. Excerpt (Molotov Cocktail) also exemplifies Mehretu's painterly method: a method which is intrinsically bound up with her interests in the structure of communal spaces. "At first ... [t]here were a few characters that huddled together and created a community. As they migrated and mixed with other characters, they made new cities. Eventually a whole terrain would be drawn upon and entangled with a narrative. When that was saturated with drawing, I would pour the acrylic-and-silica mixture of paint over the entire surface. It would dry into a smooth transparent ground that I could draw on, with the previous drawing embedded underneath. This created a stratified, tectonic geology in the paintings, with the characters themselves buried - as if they were fossils" (J. Mehretu, quoted in "Looking Back: Email Interview Between Julie Mehretu and Olukemi Ilesanmi, April 2003", op. cit., p. 12). In this sense, Mehretu's approach to the act of painting becomes a metaphor for the very types of social process that underpin her captivating body of work.